Out of the box connectivity with ERP system such as SAP, ERP LN, Baan, IBM Maximo and others. Empowering standard communication interfaces (ODBC, OLEDB), web service, XML, OPC, TCP/IP as well as specific protocols to communicate to external systems, equipment and control system. 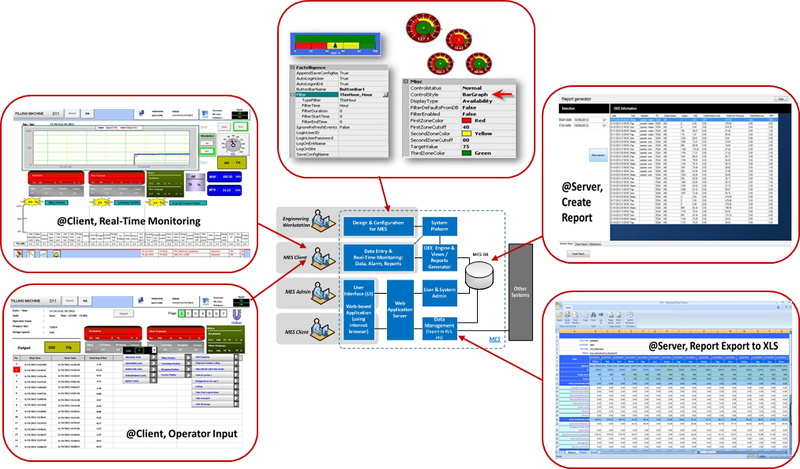 Flexible and reliable for management, execution, and monitoring of production orders. Configuration of workflows with optional paths and dynamic flow (routing). Fully features with automatic mapping of a routing coming from ERP and confirmations of ERP operations. Guides the operator through each steps with the required production and safety instructions and checks. Integration with common document repositories. Enables instant messaging and logging of shift notes. Collecting and tracking real-time equipment downtime and interruptions, complete with information and causes for further analysis. Non-productive activities tracking (e.g. downtime, slow speed), idle and rework time tracking. Configurable effect on a product unit affected with down-time (abort, resume). Management of material storage location and levels. Support material movement within warehouses and its elements (cells, packages, silo's, containers, etc). Material compatibility management. Integration with external warehouses and inventory management systems. Production calendars configuration: shifts, working time, exceptional days, and operation mode. Accurate management and tracking of staff attended hours (Join/Leave) and activities on a given product against defined production time. Reporting details to ERP. Plan, create and execute equipment maintenance tasks based on observations or planned preventive. Execution of task with support of instructions, checklists etc. Keeping track of when the request was created, started and completed. Overview of active maintenance requests. OEE dashboard showing current and historical availability, performance and quality parameters and their contribution in the overall equipment effectiveness. Real time visibility and analysis capabilities to enable operational decisions. Motivates production teams to maximize utilization, uptime and quality. Easy to use dashboard that enables users to design and view reports and dashboards based on data from different sources (transactional business data, production information and enterprise real-time data). Supports hierarchial structure, drill down, export to Excel, print to PDF etc. Integrated quality management, including quality parameters management, manual or automatic data collection, product test certificates. In-process quality control, automatic tolerance validation, manual or automatic reporting of non-conformities, checklists support. Tracking and tracing of individual parts, lots, batches, assemblies. Material identification, real-time reporting of material consumed and material produced, management of material compatibility and availability, weigh & dispense support, material genealogy.